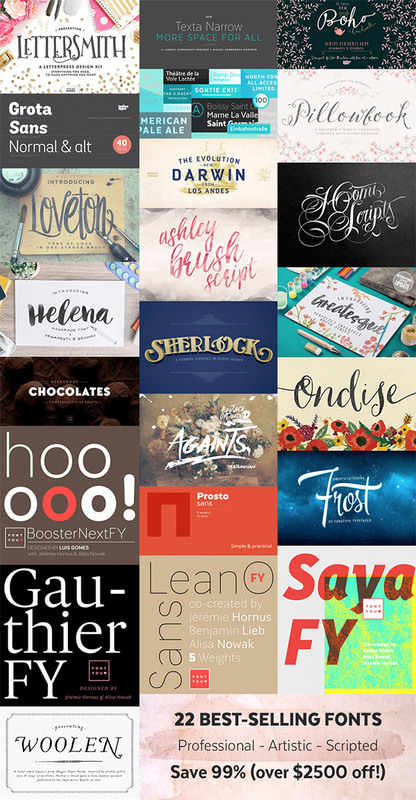 A couple of weeks ago I spread the word about a massive 99% discount off a bunch of professional and artistic fonts. That offer was due to expire a couple of days ago, but due to popular demand it has been extended to the end of the week (Friday, May 1st). If you already picked up the deal, I hope you’re enjoying your new toys! I received some great messages from people who were thrilled with their purchase. I’d love to hear which font is your favourite, or see designs where you had the opportunity to put them to use. If you missed the news about the deal, this is a great opportunity to explore the awesome fonts on offer. This bundle contains 22 professional font families worth $2622, discounted by a massive 99% leaving the price at just $29. Each font comes with multiple weights, extensive language support and loads of contextual alternates, which sets them apart from the bog standard free fonts you can find on the web. You also get extended licensing and free web fonts so you can safely use these fonts in all your design projects. In my original review post I previewed 5 of my favourites, so here’s a look at some of the other top quality fonts from the bundle that I didn’t have space to feature. Texta Narrow is a contemporary sans-serif font that comes in 8 weights from thin to black, along with alt and italic versions. These preview graphics show just how beautiful it looks set alone on a flat coloured background. Sherlock Pro is packed full of Opentype features which add distinct flourishes and swashes onto characters to create beautiful typography. The examples above show just how many variants of the same word can be produced with these alternates. Pillowbook is a delicate font with a lovely rustic feel. The subtle irregular baseline and hand drawn quality to each character will give your work an authentic imperfect hand-lettered look. Grota Sans is a massive family made up of 40 fonts. Its bold stance makes it a winner for headlines, but the 10 different weights also makes it worth considering for body copy where you’re looking for a typeface with a little extra style. Helena is a beautiful, simplistic handwritten font with additional ornaments and a bonus set of Photoshop Brushes. The brush like appearance of this typeface makes it a perfect font to use with inky or watercolour textures and overlays. Other than the 99% discount, one of the most enticing features of this bundle for me was the extended licensing that is included for every font. This means you can safely use them in your design projects, and even use them in items you intend to sell, such as posters or art prints. Remember, this deal should have expired by now and there’s only a couple of days left for the extended period, so grab it while you can! I am attempting to purchase this deal, but I am not able to. It’s expiring today, but the deal says it’s over. :( Please help. It looks like Design Cuts is under maintenance at the moment – designcuts.com/whats-happening-at-design-cuts/. The bundle was due to expire today, but the Design Cuts team are a bunch of kind folks, there’s a chance they might arrange a late purchase if you contact them directly and explain the situation. Good luck! Thank you for posting great content! Hi Chris, great site, great stuff! I am so gonna follow you from now on. I too wanted to buy the fonts today, but did it expire yesterday? I like this article very much, thanks for sharing! Great news for the graphic designer to avail this offer.. I also suggest this to my friends..